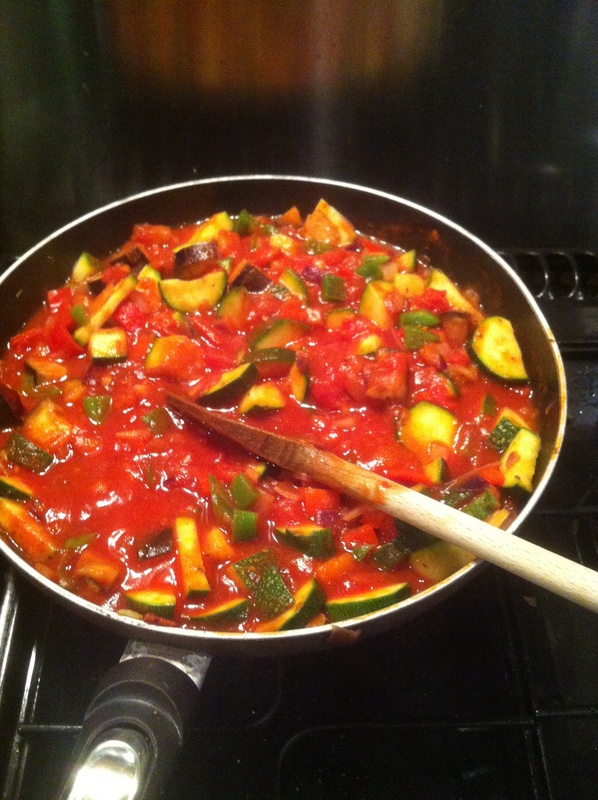 I don’t usually make ratatouille out of courgette season. In the summer I always have a glut so it regularly appears on my meal plans. However, they were very reasonably priced in Aldi and they also had some delicious looking red peppers. It had to be added to my meal plan! It is lovely served with rice or pasta and topped with grated cheddar. Healthy, yummy and still good value. I vary this and never use a recipe; however this is roughly what I include this time. Sometimes I chuck in an aubergine too. Heat the oil and sweat the onions and garlic for 5 minutes until soft. Add the courgettes and peppers for a further five minutes. Pour in the tomatoes and add the crumbled stock cube. Season well with salt and pepper. Cover and simmer for about 20 minutes and serve. I had this with spaghetti one night whilst Mr S had Bolognese. Then we had it again the following day with nut cutlets. Ratatouille is quick, cheap and easy. It freezes pretty well too, if you do happen to have any leftovers. For more frugal recipes see my page here. Mmm, this looks delicious! Peppers can be so hit or miss during winter, it’s such a treat when you find good ones! Ratatouille is, as you say, quick and easy and vegetarian. It is also fairly inexpensive (veg being less expensive than meat) and it’s versatile, too. I sometimes use this as a base for a veggie lasagne.